The lowest Phe GMP Formula for PKU Available! Now the lowest Phe GMP product for PKU available! 30-44% less Phe than other GMP PKU formulas. Only 20 mg Phe in 20 grams protein. Only 108 calories per 20g PE. Only 5g total carbohydrates and No Sugar. 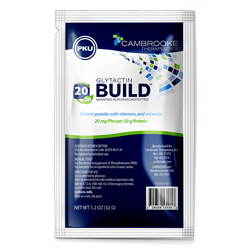 Glytactin BUILD 20/20 is designed to make Glytactin protein available for those on a low phenylalanine diet who are seeking more protein, fewer calories and lower Phe than other GMP-based PKU medical foods. At only 108 calories and 20 g Phe per 20 g of protein equivalent, Glytactin BUILD 20/20 is the lowest calorie, lowest Phe GMP-based formula available. With a complete profile of vitamins and minerals as well as probiotics to support digestive health, Glytactin BUILD has a neutral flavor to be taken alone or as a way to build up the protein level of other PKU formulas or low protein food items. Glytactin BUILD is designed to make Glytactin protein available for those on a low phenylalanine diet who are seeking more protein and fewer calories than traditional PKU medical foods. At only 54 calories per 10 grams of Glytactin protein, Glytactin BUILD 10 is the lowest calorie GMP-based formula available. Only 54 calories per 10g PE packet. 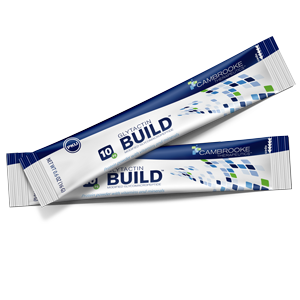 With a complete profile of vitamins and minerals as well as probiotics to support digestive health, Glytactin BUILD 10 and BUILD 20/20 have a neutral flavor to be taken alone or as a way to build up the protein level of other PKU formulas or low protein food items. Natural intact whey GMP-based protein boost. Convenient powder packet – just add to beverages or your PKU formula. Contains complete profile of vitamins and minerals. Contains probiotics to support digestive health.